Independent investigative journalist Porter has written many pieces on Yemen including “The U.S. Provided Cover for the Saudi Starvation Strategy in Yemen.” He said today: “The political pressure on Trump to break with [Saudi Crown Prince Mohammed bin Salman] is growing rapidly. 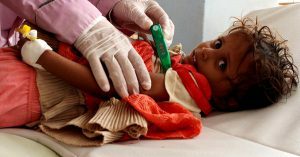 ’60 Minutes’ had the first hard-hitting U.S. television report on the atrocity in Yemen with heart-rending footage of starving children and clear identification of Saudi responsibility. … What’s missing from the segment of course is U.S. responsibility for the Saudi war. Nevertheless the politics of the issue are now changing rapidly.” See “60 Minutes” segment from Sunday night here. Davison is a Washington-based researcher and writer on international affairs and American politics. He previously worked in the Persian Gulf for The RAND Corporation.He just wrote the piece “‘60 Minutes’ Imagines A Different War In Yemen,” which states: “It is no exaggeration to say that the Saudi operation in Yemen depends on this ongoing logistical support from the U.S. It also depends on arms, like American cluster bombs and British missiles, that U.S. and U.K. arms dealers eagerly sell to the Saudis. Which means that it’s within American and British power to end this atrocity, to end the starvation, to force the Saudis to reopen the entire country to humanitarian aid. But whether it’s because they believe Saudi propaganda about Iran or they’re simply too invested in maintaining their toxic but very lucrative relationships with the Saudi monarchy, neither Washington nor London has taken any substantive steps to end or even reduce their involvement in immiserating the Yemeni people.